We flew out with Gulf Air to Delhi with a stop at Abu Dhabi on the way. 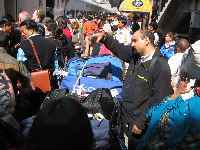 We landed in Delhi very early in the morning and transferred to a hotel for a breather before continuing. The hotel was rather palatial, with a string of small shops on the other side of the road for contrast. 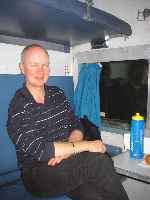 Our train left the station about 11.00am for a journey of 5 hours to Ranthambore National Park where we checked into a hotel. Up early today for our first game drive today, departing before dawn. We drove in an open back truck fitted with seats like an old charabanc. Nobody warned us how mercilessly cold it would be when driving at speed around the park in the early hours. Yes, it did say "cold" but this was freezing! The scenery and the old buildings in the park are attractive. The fort on the dominating hilltop looks majestic. Meanwhile, along the roads, we were meeting plenty of animals: notably peacocks, cheetal, sambur, nilgai and langurs. Little sign of any tigers, although there was a pug mark in the road. 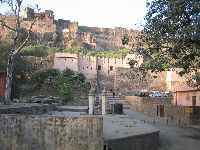 Ranthambore is one of India’s tiger reserves under Project Tiger. Poaching has drastically reduced the tiger population. Back at the hotel we sat in the sunshine and warmed up. One of the hotel staff showed us around the village and the vegetable gardens. It was warm and sunny as we waited for our afternoon drive. Instead of a game drive we started with a walking visit to the fort and the Ganesh temple, a pleasant stroll in the sunshine. Before returning to the hotel we visited a local village. In the afternoon we did have a little excitement when some Cheetal alarm calls were heard. We all stared into the undergrowth where the alarm calls were coming from. In the end two of us got a brief glimpse of a leopard: these apparently are rarer than tigers. Today we left in the morning by coach and drove to Bharatpur. On the way we watched stone masons at 11:45. Bharatpur which has a World-heritage listed bird sanctuary, the Keoladeo Ghana National Park. The Maharaja of Bharatpur diverted water from a nearby irrigation canal and it was converted into a bird Sanctuary in 1956. Now it receives pumped ground water in the dry season. It now has over 360 species of birds, notably Egrets, Ducks, Coots, Storks, Kingfishers, and Owls. By 15:30 we were at the park. Here one rides in cycle rickshaw (with a very pleasant driver in our case). The road leads through the park past the many pools. From time to time you get off and go for bird-viewing strolls. By 18:30 we were at the hotel. At Dawn we returned to the sanctuary to see more of the birds. This was a longer visit and we spent a little time around the larger permanent lake further into the park. Everywhere we went there were birds fishing. This cannot be a happy place for the fish! Later in the morning, when we had returned by rickshaw, we set off in our bus towards Agra. 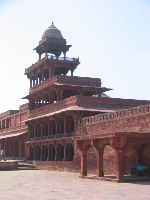 By noon we had reached Fatehpur Sikri, the emperor Akbar's deserted royal city. This is a delightful visit to an area which consists of large courtyards containing and surrounded by attractive red stone buildings. Their design is unusual and the whole effect harmonious. There is some very fine masonry-work too. Adjacent to the other buildings is a mosque, designed to hold ten thousand worshippers. This is impressive in scale but lacks the interest and the harmony of the other buildings. 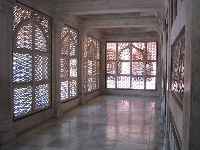 Within the courtyard of the mosque is the white marble shrine to a local holy man which is walled with beautifully-worked marble screens. Afterwards we continued into Agra to our hotel. This was comfortable and we were back into modern surroundings where we could do things like visit money-changers. Also we could sit in comfort and gaze out of our hotel room window to watch kites (living) circling above the buildings and also kites (man-made) being flown from local rooftops. In one direction we could just see the spires of the Taj Mahal visible over the other buildings. This morning we were up early and out before daylight so that when we visited the Taj Mahal we could see it as the sun rose. This was an excellent tactic since the changing light was one bonus and the absence of crowds was another. We spent much of the morning at the Taj Mahal. There is much to see: it is a huge building and grounds with ever-changing perspectives, all of which is beautiful. By noon we were visiting the Red Fort of Akbar, just along the river from the Taj Mahal. A pleasant visit with its varied buildings and internal gardens. 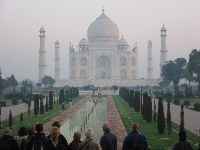 It has, like the Taj Mahal, some very fine inlaid marble in its construction. The afternoon allowed brief relaxation before we went to the station to catch the overnight train to Jabalpur. This was an interesting experience, travelling overnight with a mass of local people. The sleeper carriages were well organised and comfortable, although perhaps the sale of chains to secure your luggage from theft had been an unnerving introduction. We had lunch at our rightful hotel, provided free of charge by the horrified manager. Then we transferred to another, comfortable but shabby, hotel. All this and more was organised by the hard-working Bushan. 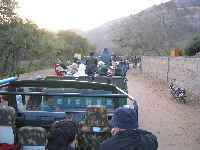 We had our first game drive in afternoon; this time in small 4wd vehicles, made by Maruti, called a Gypsy. 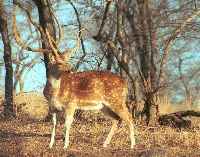 Created in 1974 and Kanha covers approximately 1,945 sq.km. undulating from 450m to 900m. This is a large park and one that is covered mainly by woodlands with a surprisingly European look about them. The rest consists of huge open areas between the woodlands. We drove around hopefully for the rest of the afternoon, but still no tigers. Finally we got lucky! During our morning drive we heard that a tiger had been seen. We rushed to the place and found many vehicles full of excited occupants. We got a glimpse of something moving in the bushes as the tiger moved away uphill. Our drivers charged round on to an upper road and waited. Through the undergrowth then we saw odd legs etc. of the tiger walking near the road, so we shuttled forward along our road. Our driver judged cleverly where the tiger might cross the road and suddenly there it was - a tiger striding across the road in front of us. Our viewing was over in an instant, but conditions had been good and we were getting photos of the tiger. It was all over before 08:00 in the morning. We felt happy as we continued our game drive and we did also have an excellent view of three Jackals who scurried around our vehicle. 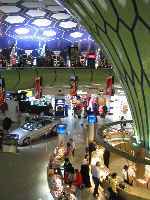 Today we were changing our hotel to a new one that Bushan had found for us. At lunch time we went back to our new hotel and settled in. This was not easy for Joan, who had been ill during the morning and continued to feel ill. A double shame since she was able to fully appreciate our new hotel, which was really comfortable and well-situated. We had the early afternoon at the hotel and I got a chance to explore upstream on the river which flowed past the hotel. Later Joan felt well enough to go on the game drive, which was pleasant, but we didn't see any more tigers. 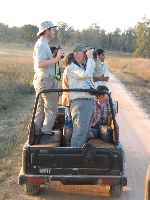 The game drives in Kanha continued, but without anyone in the group seeing a tiger. Plenty of herbivores, plenty of birds and a few other animals. The atmosphere in the group is fairly subdued. 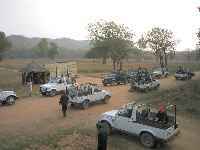 We all knew that in advance that it might be difficult to see a tiger, but we have only the one sighting for all our efforts and we have three vehicles out morning and evening each day! The days here are hot. After lunch I wandered around along the river outside our huts while waiting for the evening game drive to start. I guess we are lucky in some ways that we had the problems with the "refuse to move" people at the intended hotel. Today we drove from Kanha National Park to Bandhavgarh. We arrived and got our bags into the hotel in time to go for an afternoon game drive. The park is smaller (437 sq.km.) 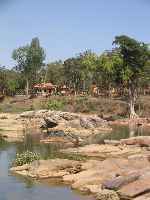 and prettier but did not immediately inspire confidence as a tiger reserve, despite its claims to have 60-70 tigers. By 18:30 we were back at the hotel having tea in the dark and wondering whether we were going to complete the whole trip with only a single tiger sighting. In the morning our three vehicles set off on three different routes. Soon after 07:00 we found ourselves sitting in a pack of Gypsys looking earnestly into the undergrowth. Yes, there was a tiger there, but 1-2 stripes was the maximum ever visible (see picture). At 07:30 an elephant turned up and was used to flush the tiger out of cover. As we moved along the road parallel to the tiger we did get a few glimpses of it, but no photos. Even so we were having feelings of guilt in seeing a second tiger when none of the others had seen one. Our fears were confirmed when we met up with the others and none of them had seen a tiger. 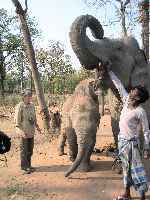 We met them at a central assembly area where Bandhavgarh's "Tiger Show" is organised. If a tiger is found in a suitable place, then the elephants are brought in and visitors get tickets to queue for their turn to see the tiger. Today the system was in operation and we got our ticket: number 35! We went to the appointed place, where many Gypsys were parked and two elephants were ferrying people out to see the tiger for a minute or two each. Time rolled on and eventually our other two car loads of friends had seen the tiger, although they said it was hard to see as it lay in the undergrowth. Our turn was still a long way off, since our sighting had made us late getting to the ticket desk. We were the last on the list and we expected the tiger to make off before it came to our turn. 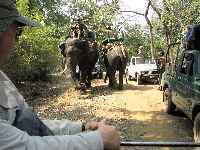 Sure enough, as we set off, our mahout got a radio message to say the tiger had gone. We searched for ages with two elephants wandering up and down the hillside through the trees: our only consolation seemed that we would have a nice long elephant ride without anything to pay. (You do not pay if you do not see a tiger - but that was not really what we wanted) Suddenly there it was: a young tiger fleeing up the hill on our left. We followed it back up the hill and circled round thicker cover, looking for the tiger. After some time searching we found it resting under a bush. It was a little hard to see, being tucked under some young trees, but it was easy to get several photos. Much later, when these had been digitised and the crucial bits enhanced, we had quite a varied set of photos. After that, who cared if lunch was a little late! We even found a troupe of Langurs sitting in the road: they seemed to think that all the cars had gone away. Later we all went out on the afternoon game drive and, whilst we did not see a tiger, at least Tarnya and Sioux saw one. They were accompanied by Ken and Sheila, who had been with us on both previous good sightings. This was another day with two game drives for most people and not a single tiger sighting. Indeed one group opted not to have a game drive in the afternoon and went for a visit to the hilltop fort that overshadows Bandhavgarh. For us, a pleasant feature of the morning drive was a visit to one of the elephant compounds where we were able to get right in among the elephants and even to feed them. We returned to the hotel with our tiger-watching holiday at an end. 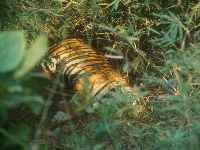 Still most of the group had only seen a single tiger which, at the time they saw it, was half-buried under a bush. Not a happy result! Bushan gave us a little hope, since he had got permission to take us on one last game drive in the morning. The offer was greatly appreciated, but by this time the feeling was that little would come of the extra visit. Our final game drive at Bandhavgarh. This time we were up extra-early and heading for a different and more remote gate to the park. By 06:30 it was still dark and we were at the park gates. Initially it was the same story: not tigers. Eventually we arrived back on territory well familiar to us from previous visits. We stopped by a familiar patch of grass by a familiar pool. This time there was a buzz of excitement: it was said there was a tiger in the grass. By now it was positively raining Gypsys and the road, a wide one, was one big traffic jam. A park official arrived to make a gap for the tiger to cross the road and unbelievably we were at the front of one half-column again! At 08:30 the tiger came marching out of the grass, looking to left and right and snarling at the cars. It seemed like I had got as many as five good photos. Sadly this was not true: the light was still poor and I suspect our Gypsy was rocking as people craned to look at the tiger. Still, one of the photos was presentable. The tiger continued on her way, through a bigger patch of grass then out into a fire-break. We watched her heading off into the distance and then began praying. We were praying that all three of our Gypsys had been in the horde of spectators. Sadly only two had been present and, worse still, the missing one contained the people who had been most down on their luck before. We were not finished yet. We still had a chance of a "Tiger Show". Yes, it was on. We got our tickets and joined the queue. This time no cliff-hanger of a chase through the woods but a controlled elephant ride out to see the tiger lying in a clump of bamboo. Turn the elephant so the people on the other side could get a view. Then back to the Gypsy. Back to the hotel and into the bus. We had a long drive to Khajuraho ahead of us, but our final extra game drive had paid off. A long drive to Khajuraho and an interesting one. It helped bring it home to me how tough life in India can be. For mile after mile the little fields abutted on to eachother. People worked the fields with tiny hand tools and lived in a home-made hut in one of the fields. This pattern continued endlessly and without break. There was one place where roadworks caused us to be diverted through a quarry. There we noticed a tiny girl sheltering from the hot sun under a tiny and torn umbrella. She was looking after a smaller child. Her mother sat on the ground alongside, with a pile of boulders that she was converting into gravel by breaking them with a medium sized hammer. After a comfortable night (for us) we went out early sightseeing at the world famous temples at Khajuraho. These have recently been designated a world heritage site. The whole thing was impressive, but it is the statues that have made a name for themselves by their rather interesting actions. In the late morning we watched a demonstration of inlay work manufacture and visited their shop. In the afternoon we drove past many more subsistence farms to Jhansi, arriving late afternoon. In the early evening we caught the train to Delhi. A tour of the Old Delhi including the Red Fort and Jamia Masjid (India’s largest mosque). Ghandi Memorial. Departed Delhi very early in the morning for London.